He's probably cheating. The King of Wands is a rogue. A charming rascal, charismatic and intelligent, he's a bold adventurer and a heck of a lot of fun to be around, if you don't mind getting into dangerous situations. You can trust him with your life but don't trust him with your woman. 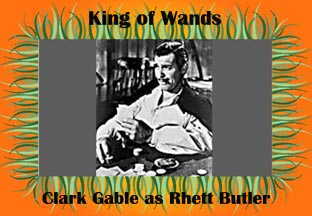 Smoking Rhett was playing at MovieActors.com--Hollywood Superstars of the 1930's.